AKC Standard: Long and narrow, skull moderately wide between the ears, not domed, stop not pronounced, the whole showing great quality. Nose black to liver. Amhearst standard (early 1900s): Head and skull: Long, not too wide or too narrow, tapering toward the nose. Skull should be shapely, but not domed between the ears. Stop not pronounced. Jaws long, fine, and well made. Smellers long, 5 warts defined. Pre-1971 FCI standard: Head: long, narrow, with taut skin. Viewed both from the side and from above it narrows little by little to the muzzle. The stop is not prominent. The top of the skull is flat, broadening between the ears. The occiput is prominent. The muzzle is long, with chiseled lines, powerful, with the nostrils in straight line or slightly raised. Arab "standard": Head—should have two fingers width across the top of the head between the ears. There should be plenty of loose skin in the cheek. Note: The FCI standard substitutes the word "nobility" for "quality" which seems to be more descriptive. Comment: A wide variety of acceptable lengths and widths are acceptable. Exact measurements are less important than overall look. Most breeders strongly prefer the head planes to be parallel or nearly so. The backskull should be flat. The muzzle is generally longer in males than females, but is usually approximately the same length as the backskull. Viewed from the front, the head gradually widens to the backskull; it should not look like a lightbulb, with a narrow muzzle and wide backskull. The saluki head differs from the Afghan head in that the planes are generally fairly parallel, there is far less of a Roman nose, and the head is not as deep top to bottom. For many years we had a problem with many dogs being down-faced or too deep; at present we have too many dogs with overly pronounced stops. We also too frequently have dogs with overly developed frontal bones, which makes a big bump on the front of the backskull just behind the eyes. There's a lot of leeway as far as what's a correct saluki head. But it's not short and wide, and it's not pencil narrow. It should be in balance, such that viewed from the front, the muzzle tapers to gradually widen to the backskull, rather than abruptly doing so with the shape of a lightbulb. The backskull should be flat on top, both side to side and front to back. Some Salukis have overly developed frontal bones, causing big lumps on the front part of the backskull behind the eyes. Those present in young dogs will often go away with age, but not if they're too large. From the side, the standard says very little, except "stop not pronounced." Unfortunately, we see a lot of pronounced stops these days. But it should also not be without a stop, something we used to see more of but don't so often now. The stop should resemble neither a Ridgeback nor a Borzoi's. The muzzle may or may not end in a slight Roman nose, but it should not be pronounced such as what you might see in a Borzoi or Afghan Hound. The standard does not address head planes, but most breeders prefer them to be parallel or close to it; a down face is not desirable. It is a much more "understated" head than what a typical Afghan Hound has. The underjaw should be strong; but beware that a longer lip may overhang it, giving the appearance of a weaker jaw. The head should be neither boxy nor snipey. By the way, vibrissae are never cut in this breed. Below are some nice heads: Note from the side the nearly equal length of skull and muzzle, nearly parallel planes, smooth backskull, slanting stop, and decent underjaw. They may or may not have an occipital crest. ​AKC Standard: Dark to hazel and bright; large and oval, but not prominent. Amherst: Eyes—these are variable in color. Often dark brown in the pale colored dogs. In the golden dogs they are generally lighter brown, golden, or hazel. The variation and sometimes quite remarkable colors are a peculiarity of the breed. The chief point is the expression, which should be mild, intelligent, and almost “human." Pre-1971 FCI: The eyes are rather large but not protruding; lustrous, of a dark brown to light brown color. The shape is oval; the eye rims should be black, especially on dark colored dogs. The expression is full of dignity, gentle and far away; when the dog is at attention the expression is piercing, curious. Shape is generally more important than color. Shape is influenced by the dog’s mood and level of interest. Chocolate dogs will have amber eyes. No scientific evidence exists for preferring darker (or lighter) iris color. An oblique placement is more pleasing than a frontal placement. Round, small, staring or squinted eyes are equally faulty. Lid disorders are a rarity. A recent study shows that eye size across species correlates with speed, even more so than with being diurnal versus nocturnal. Larger eyes have more receptor area and thus more acuity. Of course it's not known how much the lid opening correlates with eye size within a species. Desert and plains animals tend to have more obliquely set eyes to better spot predators or prey over a wide expanse. Running dogs also need to be aware of other dogs approaching from the side. But frontal set eyes aid in depth perception. Thus, the saluki eye placement is a compromise. It's possible that eye size in dogs is more than just cosmetic. a 2012 study found that the two main determinants of eye size between species is body size (no surprise) and speed. Greater eye size leads to greater acuity, and fast moving animals need greater acuity to avoid collisions. It turns out that nocturnal versus diurnal has relatively little influence, and that is mostly in the amount of cornea exposed, as the cornea gathers light. It seems counterintuitive that a desert animal should have a large eye, but the Arabian horse, camel, desert fox and antelopes all have large eyes. An obliquely set eye enables a wide range of vision and is found more in animals that live in an open environment. It enables prey animals to see predators over a wide space, but also enables predators to see prey, and to avoid obstacles when running---within limits. Some degree of frontal placement is needed for better binocular vision. Amherst: Ears drooping, set on high, and should be broader at the top. Leather must reach the corner of the mouth (or beyond) and be covered with long, silky hair. They should not lie flat against the head as in the spaniel, and when pricked should come rather forward. Pre-1971 FCI: The ears are set rather high, carried hanging and adorned with silky, sometimes slightly wavy long fringes; they are approximately 7-8 cm (2.75—3.1 inches) broad and 11-14 (4.3—5.5) long. At attention, the dog raises its ears and directs them forward. Current FCI: Long and covered with long silky hair, set on high, mobile, hanging close to the skull. Current English: Long and mobile, not too low set, covered with long silky hair, hanging close to the skull. Bottom tip of leather reaches to corner of mouth when brought forward. provided ear is covered with silky hair which may grow only from the top half, the standard is complied with but longer hair is also correct. Comment: Although not in the AKC standard, most breeders feel strongly that the ears should be set on high—the higher the better. Notice that the early Amherst standard, the past and present FCI standard, and the English standard calls for either ears set high or "not too low." The appearance of ear set will be influenced by the dog’s mood and interest. It is difficult to evaluate mobility in the ring, as most salukis will ignore all attempts to get their interest. Some ear leathers are too short; a rule of thumb is that the bottom of the leather should reach the inner corner of the mouth when brought (not stretched) forward. The request to have the ears hang close to the skull doesn’t mean that they must hug the head; it is to fault the dog whose ear flies out to the side, as though it was trying to fold into a rose ear but didn’t quite make it. In many dogs the feathering grows only from the upper half, or less commonly, the lower half. This is not to be faulted. 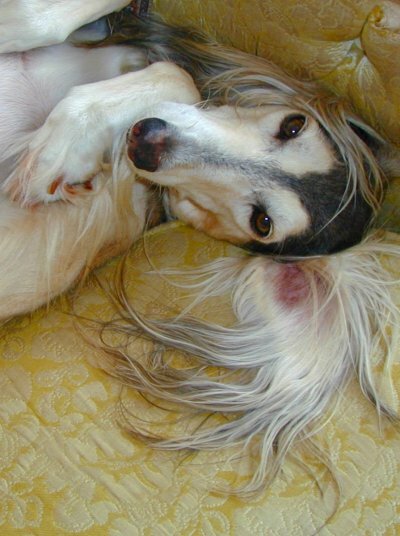 As a point of interest, salukis in the Middle East often have cropped ears. Does length matter? Two years ago the SCOA sent a notice to all AKC judges stating that length of feathering didn't matter and should be ignored. While I understand the intent (I hope) I disagree with the wording. As written, the letter directs judges to disregard parts of the AKC standard that twice call for "long silky hair (ears, tail) and twice call for "well feathered" (tail, between toes) in feathereds. While what constitutes "long" and "well-feathered" may be a matter of personal opinion, it is surely not the same as 'short" and "sparcely feathered." What I DO agree with is that 8 inch feathering is no better than 4 inch feathering when evaluating dogs. Pre-1971 FCI: The nose is black on dark animals; on light colored specimens they can be brown or even lighter. Comment: Pink noses are not the same as liver. The liver was almost certainly placed in the standard to accommodate chocolate dogs. It is possible for a cream to carry chocolate and so have a liver nose, but these dogs also have liver eye rims and light eyes. Most light noses you see are just poorly pigmented. They are almost to be expected to fade in older cream and gold dogs, and similarly, older grizzles will more often than not have a light strip down the middle. The noses below show poor pigment, liver pigment (oops removed due a complaint! ), and grizzle stripe. AKC Standard: "Teeth strong and level." Pre-1971 FCI: The bite is powerful and complete. Comment: Virtually all breeders feel that “level” refers to even placement of the teeth, rather than a level bite. Most salukis have scissors bites. 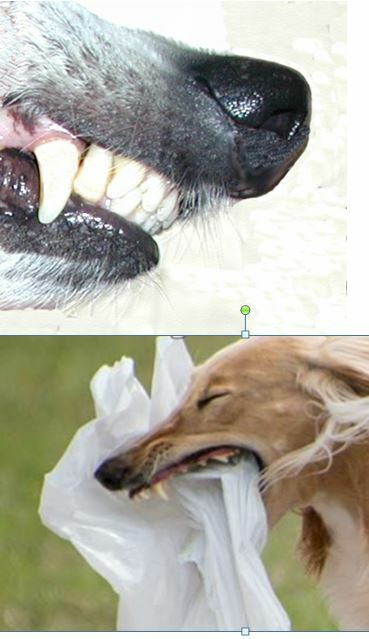 Bite problems (mostly overbites, base-narrow canines, and wry mouths) are occasionally seen. Missing premolars are also seen., but are not that common. Few judges check for premolars.